His name is William Forsythe, but his friends call him Bill. And he makes dances. Some of them for the evening. Some of them quiet. All of this is true (his friends really do call him Bill). And yet, much like the title of Forsythe’s A Quiet Evening Of Dance, these words fail to communicate the genius of this once-in-a-generation visionary. In fact, it feels like nothing short of outright hyperbole is capable of doing justice to the radical invention, complexity, and sheer uncompromising rigour of Forsythe’s remarkable choreography. But for all its semantic inadequacies, the mundane title of this collection of new and repurposed work is, at least, instructive. Although not so much as an expression of intent, but rather as a disclaimer. There’s none of the edgy, pumping electronica that’s become the default of many modern dance programs. Nor is there the lush, romantic tones of a classical ballet’s pit orchestra. Indeed, much of the first half of the night is scored by little more than distant birdsong, rhythmic breathing and the staccato scuff of sole against stage. The design of the production is equally minimal. Save for the occasional use of vibrantly coloured gloves and matching sneakers, costuming is limited to seemingly off-the-rack active wear. The stage is totally bare; the lighting, a simple flood. A more basic production could hardly be possible, but this space is far from sterile. For a little over an hour, it proves to be a place of unlimited physical possibilities, where the only extravagance needed is the virtuosity of seven highly trained bodies and their ever-shifting tessellations. There’s a fascinating, almost inexplicable duality that emerges. Feats of audacious technical and cerebral prowess are executed with such an effortless level of subtlety, it's as if the audience’s well-earned awe – or even the audience's presence altogether – is all but inconsequential. This is not a criticism but it does reveal Forsythe's priorities: his mission is to chart the frontier of his craft, not to pander to a crowd in search of simple entertainment. But while A Quiet Evening might appear wantonly austere at first glance, considered another way, the confidence of this production’s restraint is, in itself, a grand act. Forsythe’s incredible strength of purpose is the product of a career built upon a foundation of the strictest classical ballet, decoded, deconstructed, and reassembled in countless ways over more than four decades. Today, Forsythe’s influence on contemporary choreography is difficult to overstate. His ever-evolving, thoroughly exploratory approach has repeatedly detonated an explosive impulse through the philosophy and function of classical technique. Yet somehow, his dance has simultaneously protected its historical and artistic pedigree, lighting the way of ballet’s future while maintaining a deep respect for its past. Opening the evening, a series of duets are built from the lexicon of ballet, but in conversation with a more inscrutable vocabulary of eccentric gestures. This is no act of gratuitous contortion, however, but rather a transformative lens through which to view the human body. Particularly impressive is a duet between Brigel Gjoka and Riley Watts, who engage in a sparring match exploring the full spectrum of physicality, from casual swagger to eruptive arabesque. 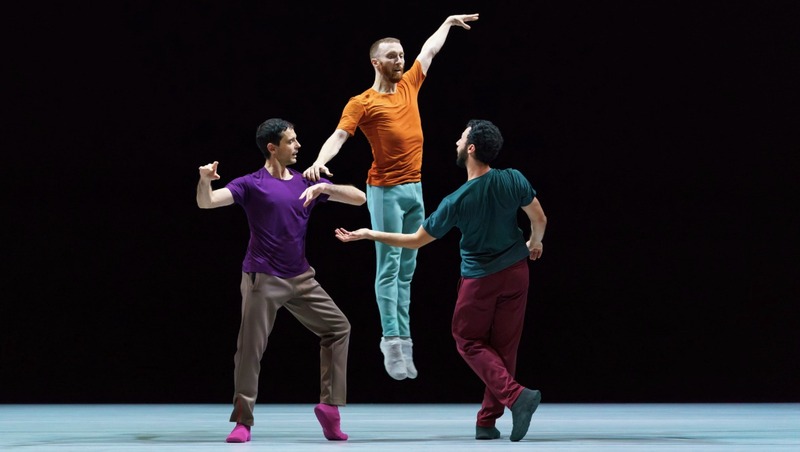 Forsythe is a name that is often spoken about with breathless reverence, and duly so; his revolutionary perspective didn’t just break the rules of ballet, it rewrote the rulebook. But it would be easy for that iconic status to create an impression of Forsythe as a severe aesthete of the avant-garde elite. In reality, his work is filled with humour, wit, and a playfulness that speaks to the extreme joy he clearly finds in creating. This is at its most evident in A Quiet Evening’s second act, a sequence of dances set to the music of Jean-Philippe Rameau. There are moments of sublime beauty and technical flair, but also in places, a jestering style of comedy. Christopher Roman’s arms spin like a clownish, juggling automaton; Rauf “RubberLegz” Yasit lives up to his nickname by startling a pas de deux, scuttling past like a surreal, hip-hop crustation. It’s this clever summoning of puckish whimsy that adds a powerful sense of accessibility to a program on the bleeding edge of contemporary expression. And quietly (in the evening) it proves just how much dance can reveal about the extraordinary possibilities of human thought and form. First published 18 Oct 2018, for The Music.